It’s definitely necessary to avoid spoilers on this one. 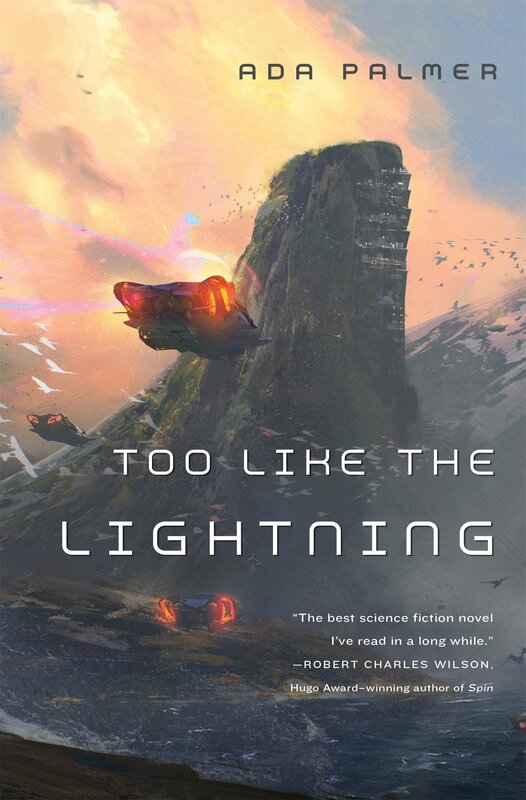 Ada Palmer’s dark novel, Too Like the Lightning, is partly fantasy, mostly science fiction, and completely fascinating. Oh, did I mention philosophy? It’s clearly a work of philosophy as well. And sociology/anthropology. And a bit of linguistics. And definitely political science. And to some extent it’s a mystery. I’ve surely left out some other categories, since this massive 432-page tome of sometimes dense prose contains multitudes. And it’s only the first of two (or possibly more) parts. None of that explains why it’s necessary to avoid spoilers. Well, I can’t tell you why, because that in itself would be a spoiler. You’ll just have to read the book. Or listen to it. Mostly I listened to the audiobook, in a magnificent reading by Jefferson Mays. I could have happily left it at that, but I felt compelled to read some of the dead-tree version as well, partly just to check on the spelling of some of the invented words and partly to see if the prose read as well in print as it does aloud. Both media are successful. If you decide to follow my advice and read (or listen to) Too Like the Lightning, you will need to pause frequently to think about what’s going on, especially in the first third. It’s that type of book. Palmer introduces ideas with very little exposition, so the reader (or listener) needs to stop and figure things out. If that’s not your cup of tea — if you like to be told explicitly what’s going on, as I occasionally do — you will be frustrated. But I was never frustrated in this case, as there are only certain contexts in which I like to be told explicitly what’s going on; this is more like a visit to a foreign land, where part of the joy comes from figuring out the culture and the customs. Sometimes things will be explained to you, but most often you just pick it up from context. That’s a standard science fiction device, of course, and Palmer handles it exceptionally well. But her novel doesn’t have the standard science fiction ambiance; it’s more like Borges or Eco, as one reviewer point out. For one example, even though it takes place 500 years in the future, there are a lot of implicit and explicit references to the Enlightenment, which places a major role. I could go on, but I am trying hard to avoid spoilers. So I think I’ll stop here. Just just it a try!